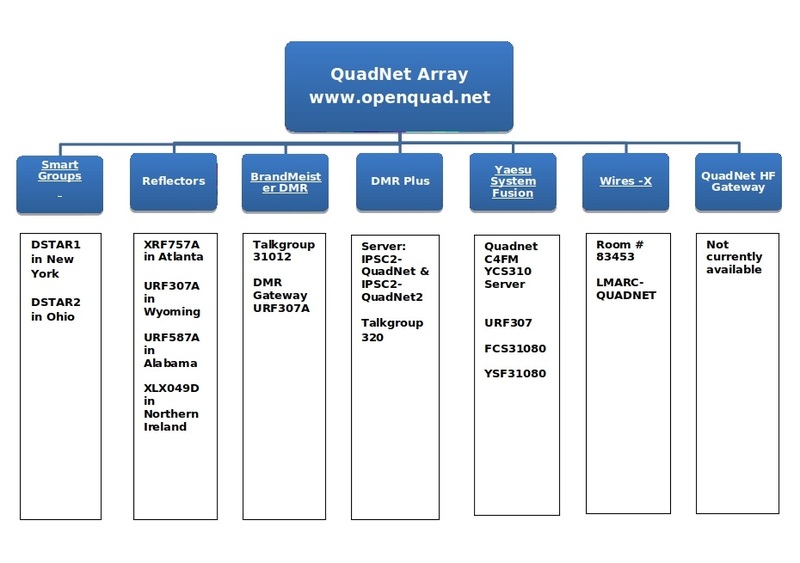 The QuadNet Array - D-STAR and DMR Done Your Way! We are an open ircDDB routing network that doesn't require registration. We contend that valid Amateur Radio license is enough to operate on the QuadNet2 USA IRC Network. We do not require a special club or repeater call sign for use on the network. As long as the call sign is valid and being legally used, we fully support your use of dongles, hotspots and repeaters (both homebrew and ICOM) on the QuadNet network. The purpose of QuadNet is to support routing. Routing is an alternate method of connecting to other D-Star users. Routing does NOT require your gateway to know the IP addresses of reflectors or repeaters to which you want to connect. You uses special routing callsigns in the UR field (YOURCALL) of your radio (instead of the usual CQCQCQ) and QuadNet figures out how to get your signal to the proper destination. For a long time, it has been understood that you can't route when you are using a mobile rig (like a hot-spot that uses a cellphone for its Internet connection) because routing uses port 40000. Well, here at QuadNet, we have solved that. You can Group Route to any Smart Group, whether you are operating from your home, or you are operating a mobile rig! The Young Operators Digital Voice Net happens every Sunday night at 7:00 PM US eastern time (23:00 UTC DST; 00:00 UTC standard). Net control will be Danielle KE8JNU (9 years old). This net is geared toward topics of interest for school age young people, either licensed or 3rd party with a licensed operator present. But even though this is focused on younger operators, all are welcome to participate. The goal is to enhance discussion of ideas while fostering the development of operating principles and techniques for young people. The First Responders Digital Voice Net happens every Monday night at 7:00 PM US central time (00:00 UTC DST; 01:00 UTC standard). Net control will be John KO4XJ. This net is primarily of interest to those that wear or have worn the uniform, members of the general public are also welcome to join the conversation. The Amateur Astronomy Digital Voice Net happens every Wednesday evening at 9:00 PM US eastern time (01:00 UTC DST; 02:00 UTC standard). Net control will be Jason N8XE. This net is focused on amateur astronomy topics such as observing, imaging, telescope making, telescopes, binoculars, an other general astronomy topics. If you are an active amateur astronomer, or just enjoy looking up at the heavens, please join the conversation. The first Wednesday of every month will focus on those who are new to amateur astronomy or looking to get started. The Multi Mode Digital Voice Net run by Jeff VE6DV happens every Saturday at 4:00 PM US mountain time (22:00 UTC DST; 23:00 UTC standard). If you can't make it to the net live, you can catch a recording of the previous weeks net at Soundcloud. If you are a Facebook user, check out the D-STAR Users group and join in on the discussion there. Reflector name: US QuadNet Array, number 37099. Instructions for using the QuadNet Array can be found on the getting started page. Be sure to look at the routing FAQ for a more detailed description of Routing. Make sure you get to the bottom line: If you don't want to do routing, you don't need QuadNet. Refer to the getting started page for detailed configuration information. Please only connect one system to QuadNet at a time. Also refrain from running multiple systems from the same IP address. Think of the QuadNet network as a telephone directory that has a unique IP address for everyone (and everything) that is logged in. If two different logins point to the same IP address your end will probably have trouble getting the addressed data to the correct node. Also, if a user has multiple logins from different IP addresses, the QuadNet server won't necessarily route your data to the proper IP address. Finally, it has been reported that some gateway software can inadvertently send incoming routed data to linked systems and this can be a real problem. In the routing world of QuadNet, if you need to link to a reflector, you should instead route to a group that is linked to the desired reflector. For example QNET20 C is always linked to XRF757 C. It is always a great idea to unlink from all reflectors and repeaters when you are using routing! New capabilities are coming out on almost a daily basis. There are far too many packages to list here. Google or Bing can be your friend in finding new packages coming out all the time. If you are new to this, we can recommend PiStar. PiStar supports a variety of small, single board computers, including the popular Raspberry Pi as well as most of the devices listed above. With a Web interface, PiStar is easy to configure and run. There are also links to YouTube videos on the PiStar Website showing how to set up and use PiStar. PiStar with a DVMega is an extremely popular combination and give you a true multimode repeater/hot spot. Routing on D-STAR is fully supported for both the DStarRepeater and the MMDVMHost! Of course you can build your own system from the ground up. If you are interested in a multimode repeater/hot spot, a great place to start is Jonathan Naylor's MMDVM Git repository. This repository is in very active development and only experienced builders will be able to complete all the requirements necessary to build a system from scratch. A DStar-only repeater or hot spot can be built from Jonathan's older, but still popular DStarRepeater+IRCDDBGateway software and is available on Hans DL5DI's OpenDV repository. Again this takes some skill and tinkering to complete. Our own N7TAE has a new system called QnetGateway that supports MMDVM and that can be easily built on a Raspberry Pi. see the N7TAE QnetGateway repository. If you have never built up a system from scratch before, this is a fun place to start, and, of course, QnetGateway fully supports routing! To gain inside information about QnetGateway, join the QnetGateway at groups.io. The QuadNet Group also offer help with your setup or help with troubleshooting when problems occur. The contact us page has several ways for you to reach out. 73 and have fun with D-STAR!